The 100 oz Royal Canadian Mint silver bullion bar is perhaps the most globally recognized government guaranteed large silver bullion bar. 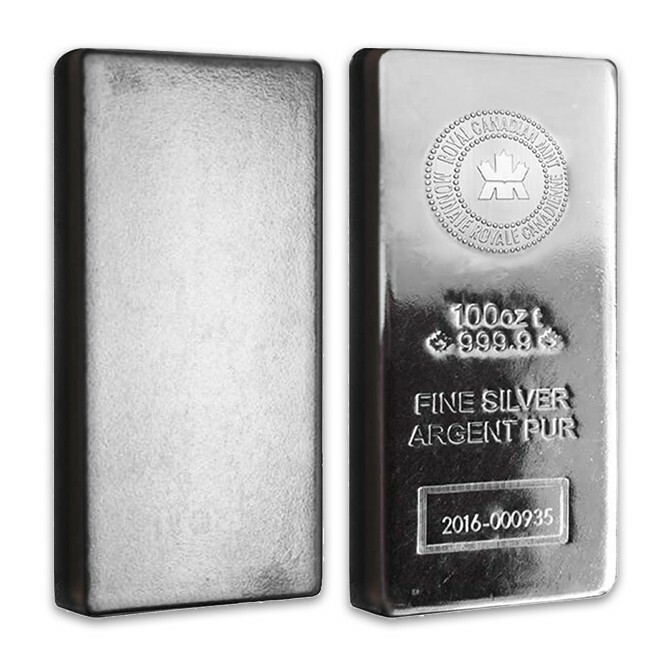 Combining a low premium over silver’s fluctuating silver spot price with the Canadian government's trusted stamp and guarantee, this is perhaps the best large silver bullion bar to stack in high volume. Renowned for their .9999 pure silver bullion products, the Royal Canadian Mint (RCM) is one of the few government backed mints in the world that produces guaranteed .9999 fine silver bullion bars. Holds 100 troy ounces of .9999 pure silver bullion. One of the few bullion bars in the world with .9999 silver purity. Features the RCM logo on the bar's front face. New design in 2017 includes year of issue, unique serial number, guaranteed weight, precious metal content and purity. An accredited LBMA & COMEX good delivery bar. Ships in protective packaging to ensure safe delivery. Eligible for physical Silver IRA accounts. The 100 oz Silver Royal Canadian Mint Cast bar is one of the most cost-effective and convenient means of owning silver bullion in bulk quantity. Calling upon design features from the world-renowned Canadian Maple Leaf coins and RCM's gold kilo bars, this popular RCM 100 oz silver bar design is new. Updated for 2017, the RCM made this silver bar’s pressed finish similar to the Mint’s gold kilo bar. Highlighting the heritage shared amongst all of the Mint’s bullion investment products, RCM added a stylized maple leaf mark which also evokes the laser mark security feature from the RCM’s Maple Leaf bullion coins. Additionally, the individualized serial number is now bordered by a series of vertically engraved lines, inspired by the coins’ radial line finish and translated to a rectangular layout. The Royal Canadian Mint is a Canadian crown corporation that mints all of Canada’s cupronickel circulation coins and government guaranteed fine bullion precious metal products. Since releasing Canada’s first domestically produced coin in 1908, the Royal Canadian Mint has built a global reputation for minting excellence. Today, the Mint’s superior technical capabilities allow it to set new benchmarks in design and quality, making it also the producer of choice for many foreign countries looking to outsource production of their own circulation coinage. The 100 oz RCM silver bullion bar remains one of the only 100 oz sized silver bars being produced by any national government. Each bar is fully backed by Canada and its Royal Canadian Mint. 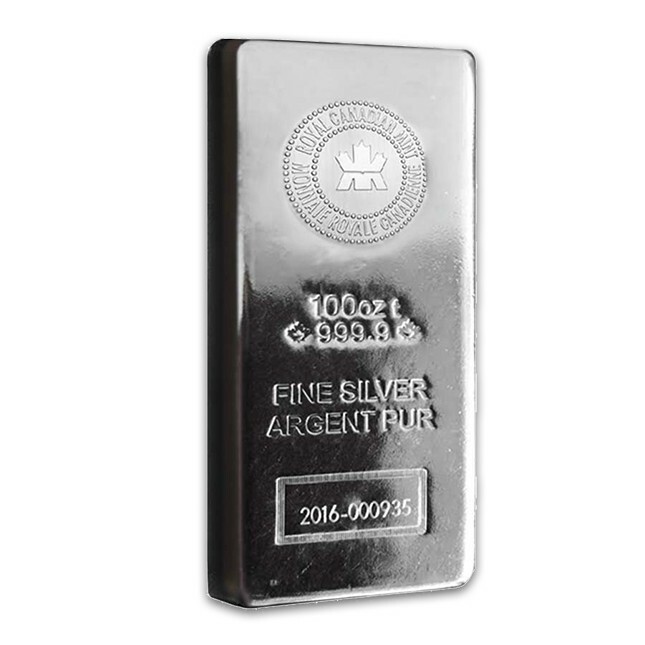 It carries a superior level of fine silver purity (.9999 fineness, whereas most bullion products sold are only .999 fine). This silver bullion bar is among the purest available silver products for private silver investors. These factors combined with its added security features make it one of the most unique and highly recognized investments in fine silver bullion globally. Its smaller cousin, the 10 Oz RCM Silver Bar, is also very popular. This 100 oz silver bar retains the same dimensions and market-leading purity that it has had since its introduction, and it will continue to be a key part of silver investor bullion holdings around the world. Best Prices on 100 Oz RCM Silver Bars!